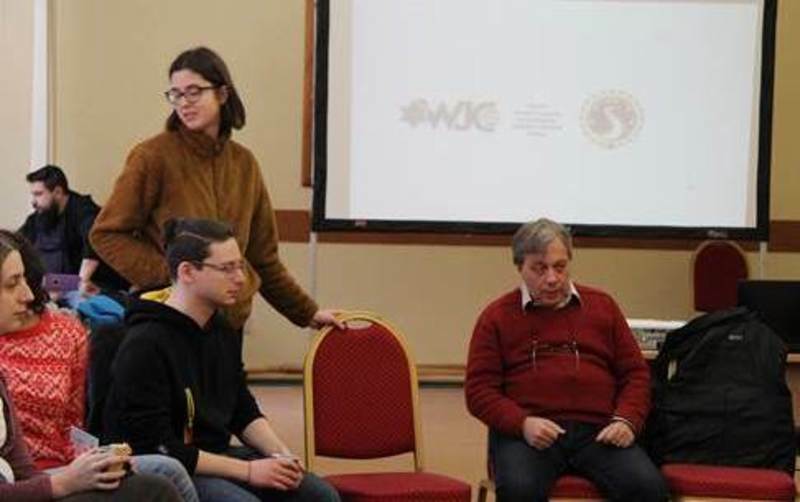 On January 2, 2019 the representative of the International Yiddish Center at the World Jewish Congress, Professor Valery Dymshitz from the University of St. Petersburg, provided two lectures in Moscow for about 30 members of a Jewish young leadership program "Knafaim". The "Knafaim" ("wings" in Hebrew) program, hosted and supported by the regional branch of the American Jewish Joint Distribution Committee (JDC Moscow), offers the youngsters efficient tools for developing leadership skills, providing them with knowledge and experience in areas such as psychology, project management, PR and granting them opportunities to realize those qualities in Jewish projects. The lectures' subjects were as follows: "Ways of development of Yiddish prose" and "Cultural peculiarities in Yiddish fairy tales". The first talk contained a survey of Yiddish literature and showed its place in the general Jewish literature. Special attention was drawn to specifics of the Yiddish literature, its distinction from other Jewish and non-Jewish literatures. The listeners could get a glimpse to the names and works of Yiddish prose classics. The second talk included theoretical introduction and a detailed analysis of one of folklore examples. Basing on that, the specifics of Jewish tale, an impact to it of Jewish history, literature and Judaism, were revealed to the audience. The listeners asked numerous questions during and after the lectures. Following this successful event, WJC YC received a gratitude letter. On behalf of JDC Moscow we want to thank the Yiddish Center for giving us an opportunity to have Valery Dymshitz as a lecturer at 2nd Knafaim seminar in Moscow. His passion about Eastern European Jewish culture served an inspirational example for our students. Not only did he provide a lecture about literature and folklore, but in a very limited amount of time gave a thorough overlook on development and variety of Jewish writings in Eastern Europe and a taste of Jewish cultural life. What is very important and valuable for us, his sessions evoked a lot of questions from students and have become an impulse to learn more about Yiddish heritage by themselves. We would love to host him and other lecturers as well, and hope for our further fruitful and close cooperation with the Yiddish Center.